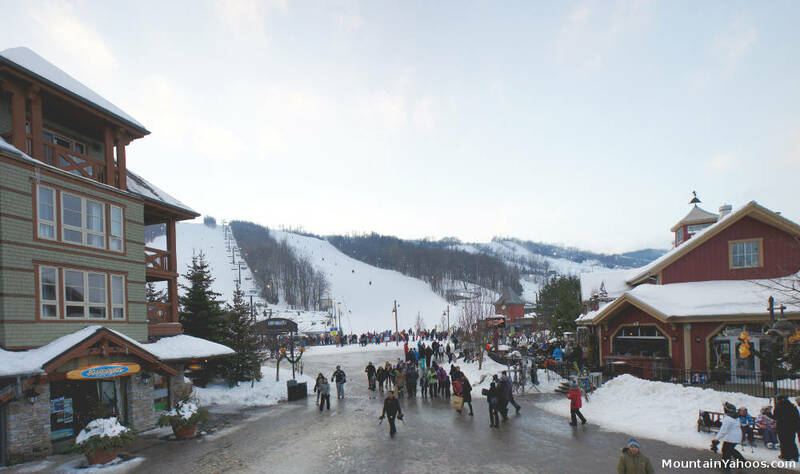 Blue Mountain is a frequent local destination resort for the skiers and boarders of Toronto Canada and is the largest of the Toronto area local resorts. 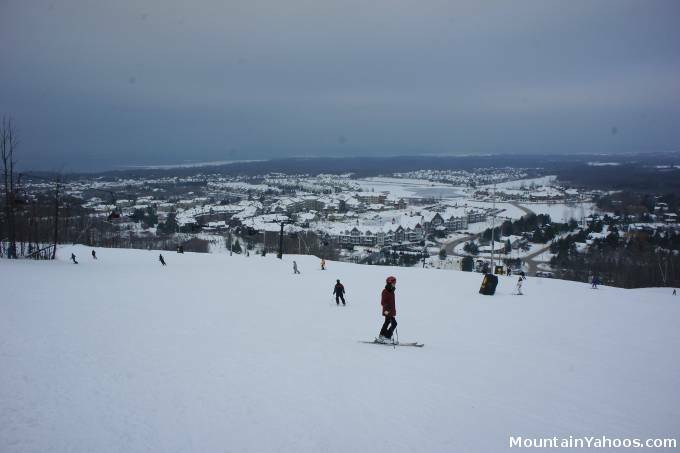 Blue Mountain is located near the town of Collingwood Ontario and is typically a two hour drive from Toronto. The resort overlooks Georgian Bay on Lake Huron, an area which is both a summer and winter playground. Runs as viewed from the village. 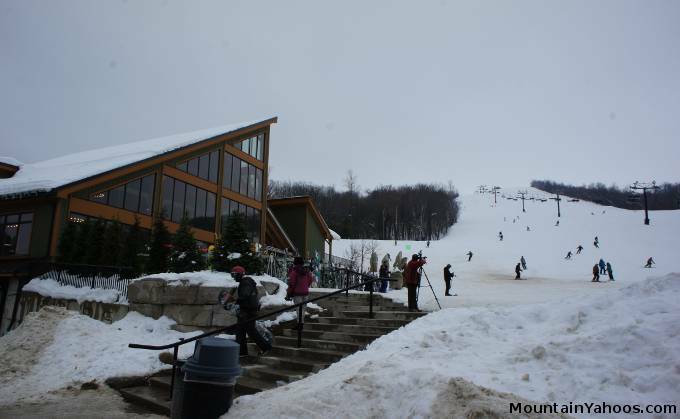 The Mountain has three ski areas. The most Southern and easiest terrain is found at the "South Base Lodge". 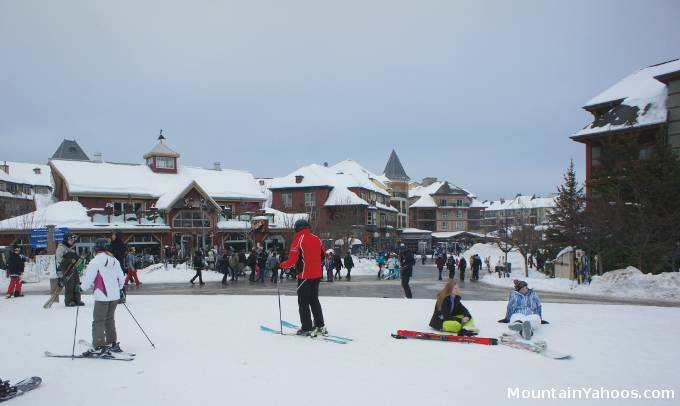 Here one can rent skis and snow boards and attend introductory ski or snowboard lessons. 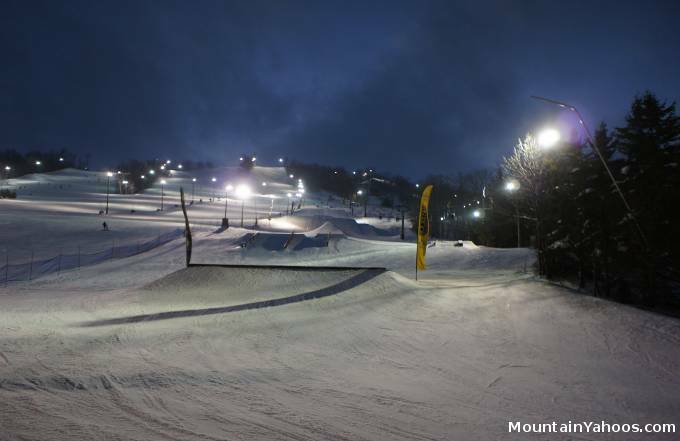 Blue Mountain is very capable at handling and training large groups of beginners at this end of the mountain. Further North is the "Grand Central Lodge" and main village with lots of shopping and restaurants. 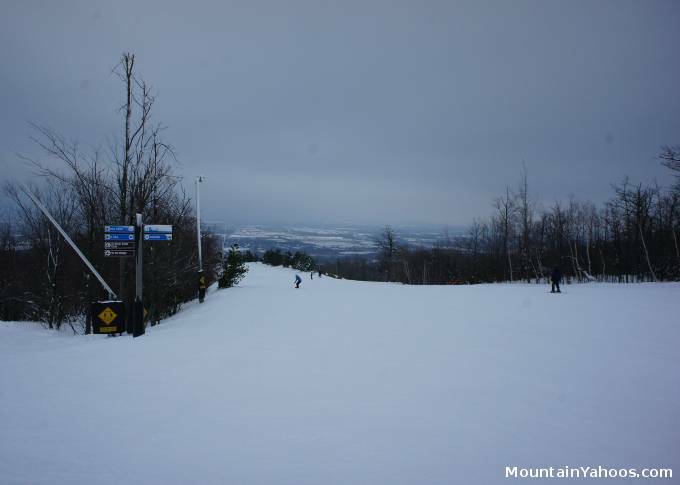 Intermediate and some advanced runs are accessible from this mid-section of the mountain. 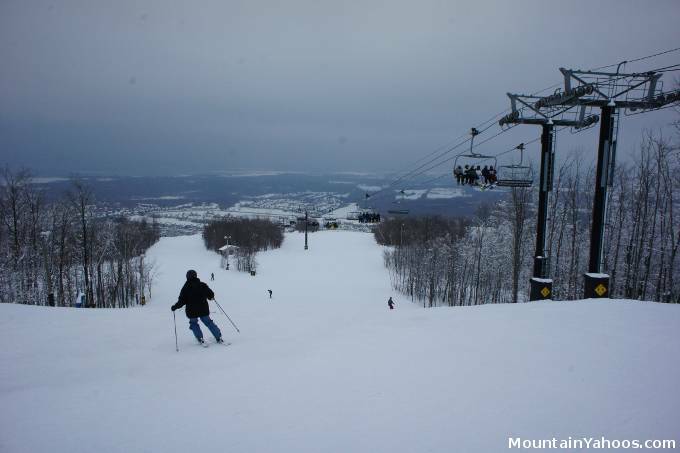 The terrain becomes steeper and more challenging as one goes to the right (North) end of the mountain, where one reaches the third section of the mountain which is rated exclusively black and double black. The mountain is predominantly beginner and intermediate terrain. 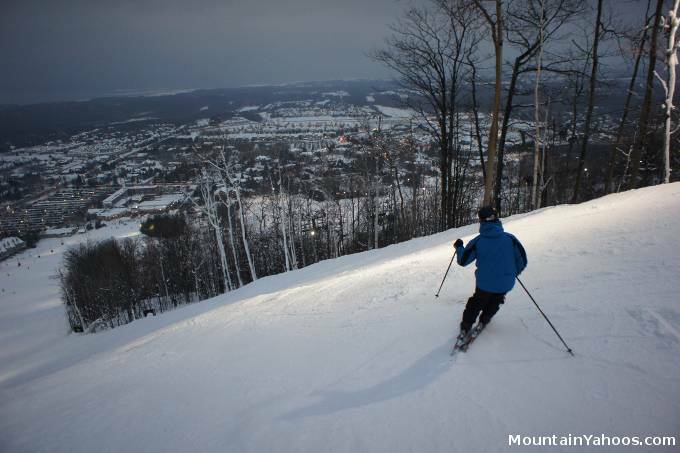 The easiest terrain is located at the Southern end of the resort (left side of the mountain on the trail map). Beginner introduction lessons are taught on three beginner levels here: stage I, II and III which are various levels of difficulty of a green beginner slope. South Base lodge and blue run "Cruiser"
The black and double black runs, while steep are hardly difficult. 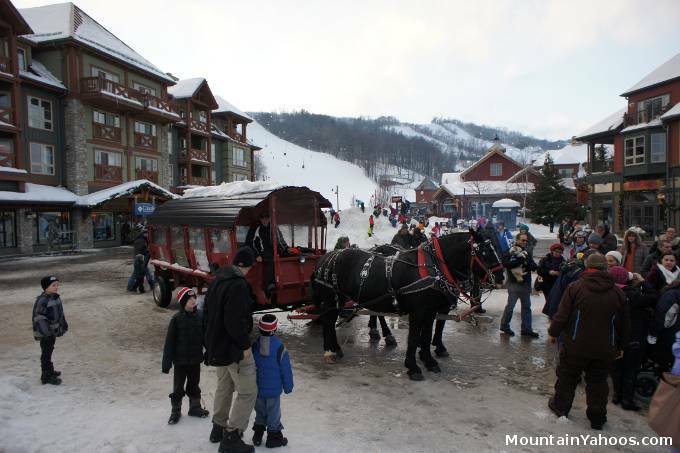 Everything gets groomed here so there are no mogul runs and while Blue Mountain offers the most challenging runs of the Toronto area resorts, they are not that challenging when compared to the the double black runs of the Western Rockies. All of the "advanced" terrain is located on the northern end of the resort. 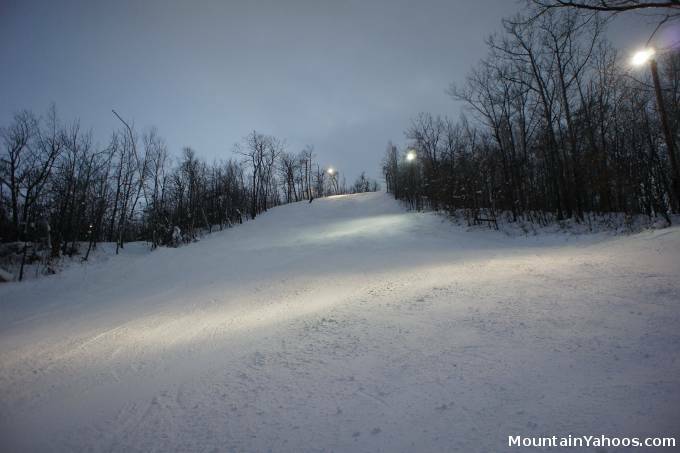 A groomed but steep double black run: "Calamity Lane"
View looking up "Calamity Lane"
There is one terrain park area which is listed as two by the trail map. 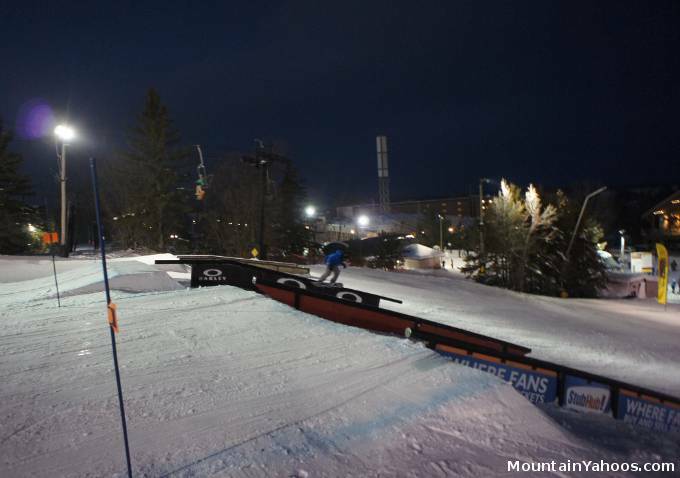 The half pipe typically does not get opened until later in the season when there is sufficient snow. 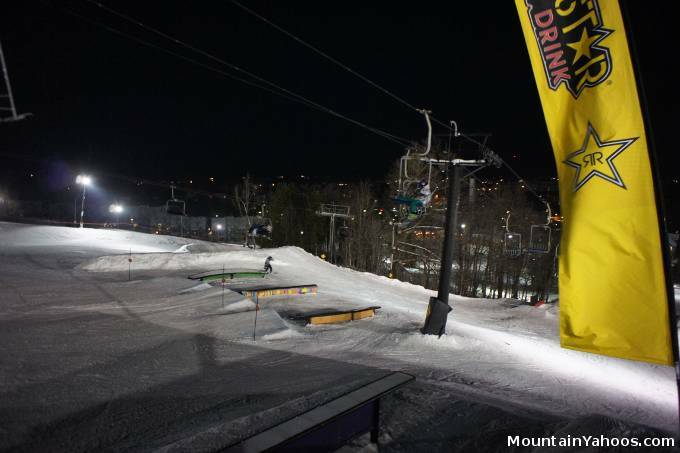 Note that the terrain park requires a lift pass which qualifies you for the park lift and helmets are mandatory. Tickets are sold as "morning & afternoon" or "afternoon & evening". There are no half day tickets - you will pay full price. 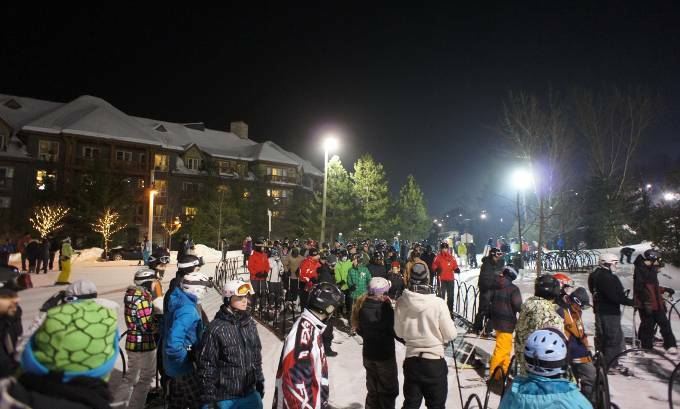 This fee structure favors an active night skiing culture at Blue Mountain which often has lift lines as long as during the daylight hours. The lighting is excellent and coverage amazingly complete. 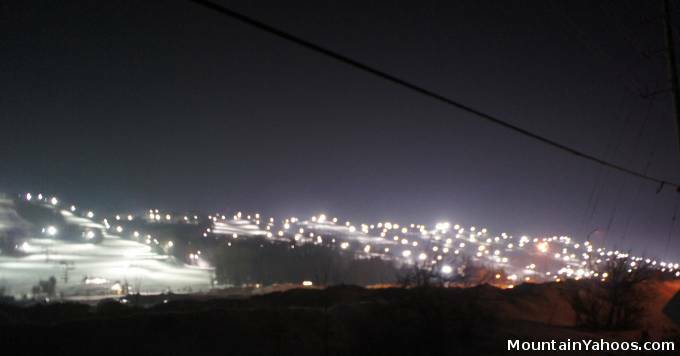 Only the most northern end of the mountain is closed (all black and double black slopes). 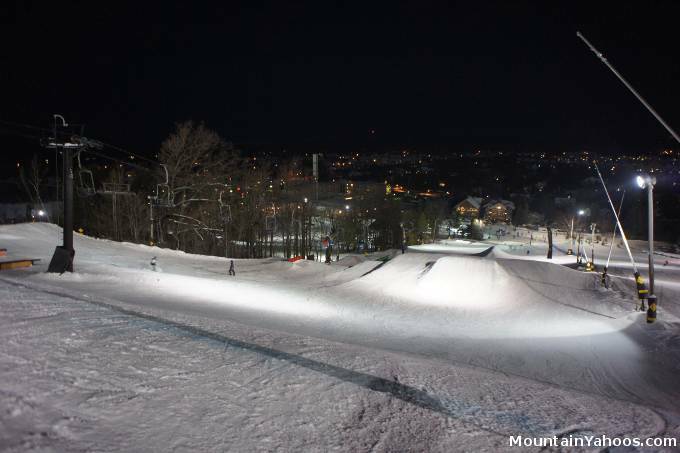 The terrain park is well lighted and open. 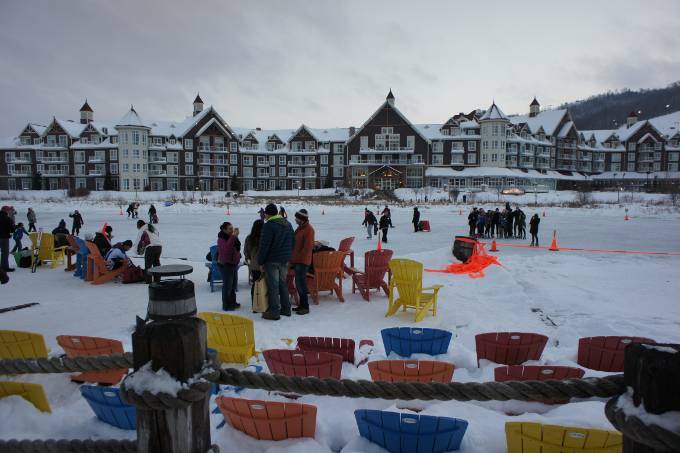 One will find that Blue Mountain village has shopping, food, apres ski bars and all of the amenities one could possibly imagine. 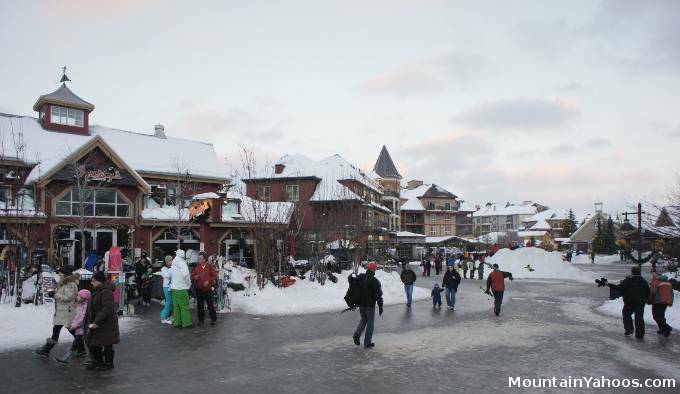 Even if you don't ski, the village could consume your day shopping and eating. Panoramic Virtual Tour of Blue Mountain Village from the to the ski lift to the Ice skating pond.